Sold by Bob Cury at RJC Yacht Sales & Charter, the 242’ (74 m) Trinity Quad-Deck MY, COCOA BEAN was delivered to her owners on August 29, 2014. 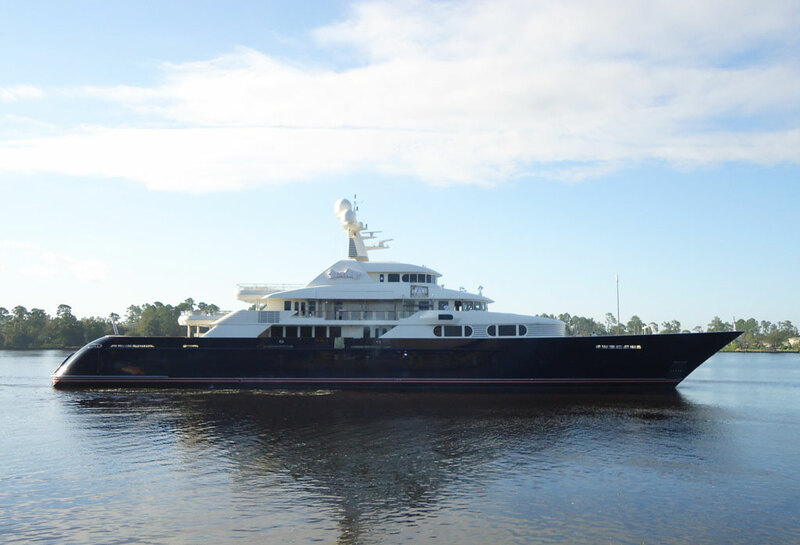 Built by the US yard Trinity Yachts in steel and aluminum, COCOA BEAN is the largest built Trinity to date and marks the largest yacht deliverd in the US during 2014. COCOA BEAN is ABS classed and MCA compliant, her exterior was designed by the yard’s in-house team, while the interior design was entrusted to British designer Evan K. Marshall. She boasts a gymnasium on the wheelhouse deck with a seating area forward of it. This 242′ Trinity Yacht accommodation is for 12 guests in six staterooms. The full-beam master suite is forward on the main deck, with an adjacent lounge that can be closed off from the bedroom via a sliding door. Five further cabins lie below deck including a full beam VIP stateroom with two walk-in closets. The tenders are stowed up on deck, freeing the transom for use as an al fresco lounge. Powered by twin 2,626hp Caterpillar diesel engines, 242′ Trinity COCOA BEAN has a range of 6,000 nautical miles at 13 knots. RJC Yacht sales & Charter sends our best wishes to 242′ Trinity COCOA BEAN’s owners with hopes for many pleasurable years of cruising to many memorable ports around the world!